JohnstonJournal.com | Jeff and Nozomi Johnston - Are relief funds getting to the people in Nepal? Home > Journal | Blog > Browse Articles > Are relief funds getting to the people in Nepal? In an article entitled "Nepal Earthquake 2015 - Petition to Transparency International, CIAA Nepal and United Nations," Sanju Lama levies pretty harsh allegations of corruption in Nepal that have kept relief funds and supplies from the quake victims. It has been reported that the government of Nepal has received funds and pledges of Billions of Nepalese Rupees from countries all over the world (Wikipedia article; Financial Tracking Service report). The generosity has been overwhelming, but most of these funds have not reached to people who are in desperate need of it, due to ongoing corruption and bribery which is deeply rooted inside the political system of Nepal. "Most people have not even received the basic needs like tents and food supplies which does not tie up with the billions collected so far by the government. It is as simple as that. Committing to transparency and actually implementing it are two different things." Aljazeera reported that, "Giving reconstruction funds directly to Nepal quake survivors could cut out corruption and administrative waste." This is precisely why it is recommended to give through NGOs, who have delivery systems on the ground. Asian Access is delivering aid directly through a network of local churches right to quake victims. Tin sheets and bamboo poles to construct a simple shelter; a supply of rice, lentils, cooking oil, and salt; bowls, plates, utensils; towels; soaps - for personal washing and for clothes washing; blankets to provide flooring and bedrolls; mosquito nets; and even candy for the kids. Would you consider giving $130 to help a homeless family get back on its feet? ...or send your check to Asian Access,PO Box 3307, Cerritos, CA 90703. After this Family Rebuidling Package campaign, Asian Access will continue distributing funds through local churches that have the flexibility to get relief to the victims who need it the most. We can't speak for all groups, but we can say with integrity that relief funds donated to Asian Access are getting directly to the people of Nepal. 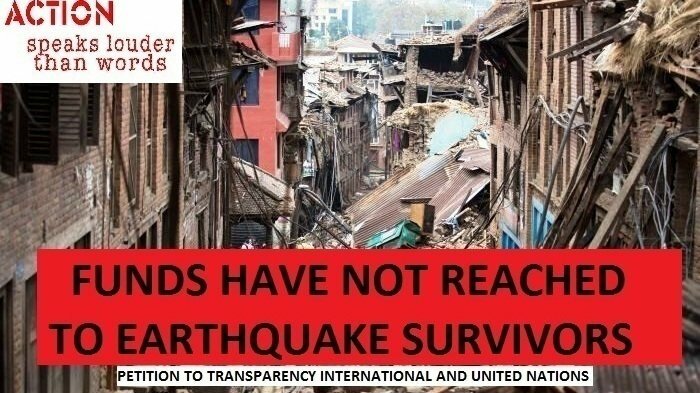 Please sign and share this petition (Transparency International, CIAA Nepal and United Nations)Transparency International, CIAA Nepal and United Nations) and help the victims of earthquake to get the aid which is being misused and delayed due to widespread corruption and bribery. They currently need 6,500 more signatures! Where is Nepal aid money going? The Guardian: How can we ensure every penny of aid is accounted for in Nepal?